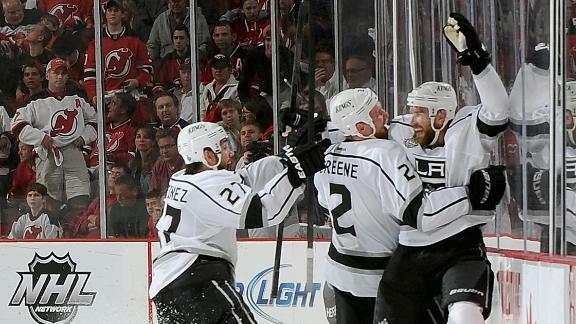 The Sin Bin Sports Blog: Are The Kings Destined To Win On The Road? Are The Kings Destined To Win On The Road? A standing room only crowd filed out of the Staples Center and onto the streets of Downtown Los Angeles. They had entered the building just over five hours earlier, some in hopes of seeing a Stanley Cup Champion crowned and others in hopes that their team would survive to fight another day. The later group walked out happier than the prior. The Los Angeles Kings went into game four of their Stanley Cup Finals matchup against the New Jersey Devils with a chance to eliminate their opponent, and do so by matter of sweep. However, the Kings slipped up and will travel back to Newark for game five on Saturday, something that might benefit them. The Kings have gone undefeated when on the road during these playoffs, racking up an unprecedented 10-0 record when away from Staples. That is where the Kings will find themselves when they have their second chance to eliminate the Devils. Moving on while on the road is nothing new to the Kings. The Kings eliminated both the Vancouver Canucks and Phoenix Coyotes, the West’s number one and three seeds, when on the road. This story that the Kings have written is held together by their performance’s in other team’s barns. So it is almost fitting if the Kings hoist Lord Stanley’s Cup on some one else’s ice. Winning at home would have been nice and the Kings would have been the first team do so since the Anaheim Ducks in ’07, Kings fans will probably cringe at that part. If the Kings do win on Saturday, and win the franchise’s first Stanley Cup, they will have also broken the ’95 Devil’s record for most road wins in a post season with 11. A little extra treat for Kings fans to savor. But first, the Kings have to win.